Great news on the West Coast: PAWcon promises to bring back a legendary experience. It’s “Survival of the Furriest” this Halloween, with an end-of-the-world party to die for! Pacanthro.org has details. Follow their Twitter for updates. Last year was their inaugural event. It snuck in under the radar of many. 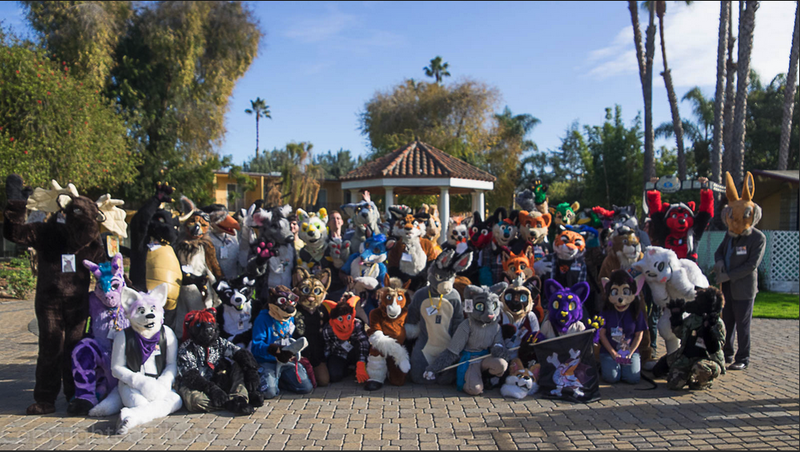 About 200 furries showed up for low-key fun. Fine-tuning of publicity and planning has brought great pawgress. PAWcon is following in the pawprints of the other well-established Furry con in San Jose, Further Confusion. (How many places are lucky enough to get two great cons?) Now they’re stepping up to stage it at Fur Con’s original venue, the Doubletree. Many people have missed the unique magic of that venue after outgrowing it. Those who remember (or missed it) can have it again! Well, here it is – the Doubletree experience, remembered with stories from Fur Cons past. I heard a great one about the party floor and how it’s laid out. The room balconies join together facing a courtyard with a many-stories tall wall. That wall has been a great space for video projection, to make a magical shared experience. You don’t get that just anywhere! Did you ever see the opening scenes of George Romero’s Dawn of the Dead? It has perhaps the most intense zombie scenes ever filmed, set in a crowded apartment tower. Can you imagine that projected on the side of a hotel this October? However the parties will be organized, this news is already inspiring ideas. The con is accepting themed party ideas… propose yours! I love that this is on Halloween. It’s always a great occasion for informal fursuiting. A con lets the world share it and make it twice as good. There’s no other day when furries share more common ground with everyone. “After a more than successful start last year we decided it was time to up our game. With new staff, board members and fresh ideas, PAW is positioned to bring you the interactive social event you’ve been craving. This Halloween PAW moves to the incredible DoubleTree hotel! The DoubleTree has played host to many fine events over the past years including; Silicon, BayCon, and Further Confusion. Fond memories will be brought back to life as the furry energy flows through the halls once again. Along with several social events, dances, dealers, games, and contests; PAW is re-introducing the famed “Party Floor” of convention lore! The second floor will be dedicated to nightly events on the vast “101 Balcony” by way of adjacent room parties. But don’t wait for this to happen! We have many positions open and would love your help! Send us an email and we will get the ball rolling for you! “We are open for Signups! Go to our website for information on how to submit your demo!